We can help to correct what we notice during the Kenko Taiso by practising Seitaiho, the method of stretching. This set of held stretches is designed to help to adjust any asymmetries in the body and to help us develop a balance and harmony within our muscular-skeletal system. But sometimes we might have some more stubborn inflexibility which is difficult to exercise by ourselves. To help, if this happens, we can practise assisted stretching movements with a partner. 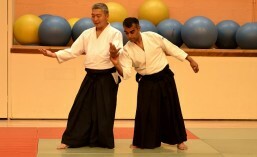 We have different sets of movements to achieve this which we call Sotaiho. All of these are applied gently and only to the physical limits of the individual being exercised.